In this tutorial, we will be learning how to hide or show multiple form fields based on a single conditional logic - using Section Collapse field/element. Before to proceed, we must get acquainted with Section Collapse field first. What is a Section Collapse you ask? In this case, we will be using the Section Collapse to split the form into sections, and we'll be using conditional logic to hide or show them according to end-user action. 1. Insert a section collapse at the beginning of each groupings you want to separate. This will mark the start of the section that you want to conditionally hide/show. Insert as many fields as you want on this section. 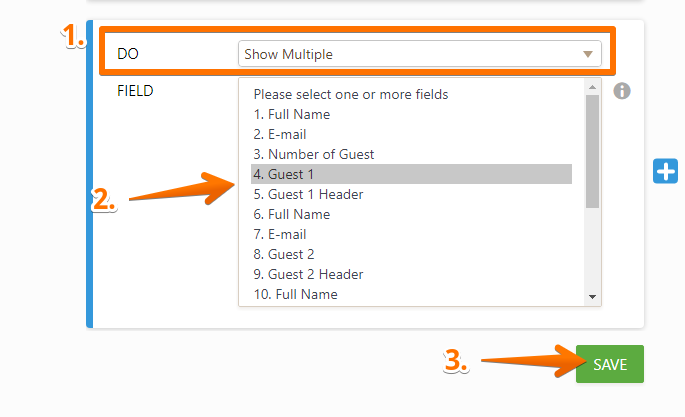 In this sample form, I will group fields related to each section of a guest, I will have "Guest 1", "Guest 2" and "Guest 3", all having their own full name and email fields. There are two important settings here, the "Section Visibility" and the "Button Visibility". 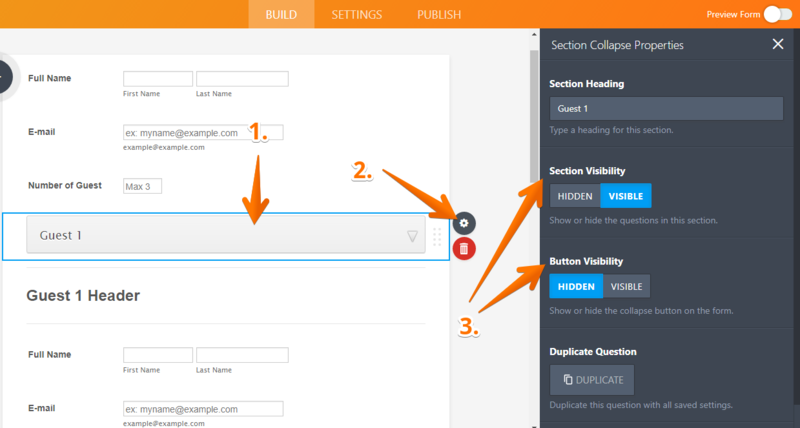 Section Visibility => This allows you to set the collapse field to open or close on default. Open meaning the section or the contents of it is visible. Close meaning the contents are hidden. Button Visibility => This allows you to show or hide the actual collapse bar or button. Set it to hidden if you don't want the bar/button to be displayed, set it to visible if you want your users to see it. Note that if the button is visible, then your users can open and close the section visibility in the live form. An arrow pointing downwards in the section collapse means this section is set to "Open" or "VISIBLE" by default. In my case, I don't want to display the section collapse button so I set the button visibility to hidden and then set the section visibility to visible. This is to make my setup cleaner as I will use conditional logic later. 2. End your section using yet another Section Collapse field. A Section Collapse encompasses all succeeding fields, except another Section Collapse. Unless your form section is followed by another one (i.e., multiple consecutive sections), you will need to place a stopper to end this section. We can accomplish this by adding another Section Collapse that is configured as [Section: Visible] and [Button: Hidden]. 3. Add a condition to hide or show a section. Now that your sections are defined, you can start adding rules to the Conditions builder. You may then formulate your conditions to hide or show the corresponding section collapses. Check out the sample forms below and feel free to clone them to your account to learn how exactly this solution was implemented. 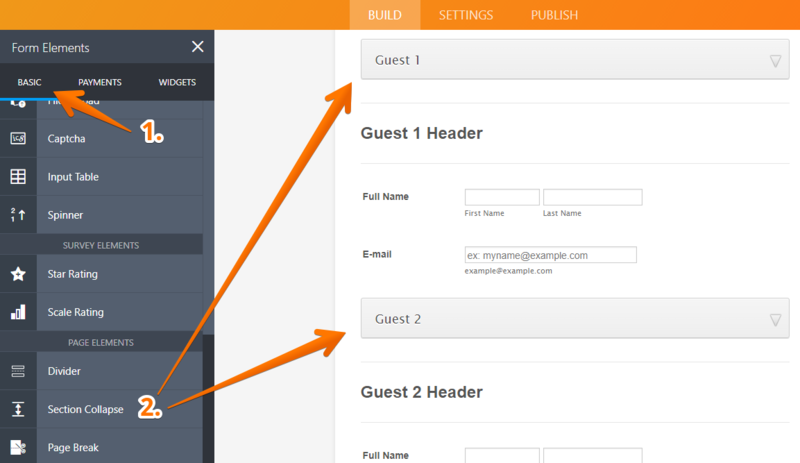 Here's a simple form that shows each section for a guest depending on the number of guests entered: https://form.jotform.com/53531501583955. Below are the steps on how the conditions are setup for the section collapse field. a. First, I setup the rules or the "IF" statement to when the action will be triggered. 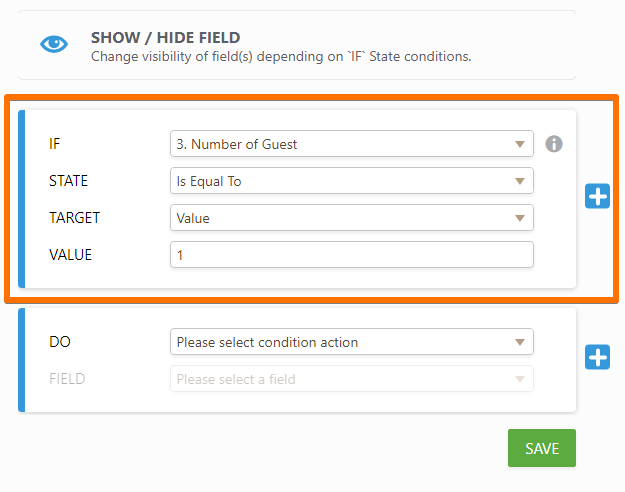 b. I will choose "Show Multiple" in this case to display the section collapse field for "Guest 1", "Guest 2" and "Guest 3", depending on the number of guests added. Important note: It is best to use the same "DO" statements on a form field that is related to multiple conditions. In my case, I will use "Show Multiple" on all section collapse fields. To select more than one field to show, press CTRL+Mouse click (Left click for Windows) or Command key+Mouse Click (Mac). c. Repeat the same process on how to add the condition for "Guest 2" and "Guest 3". e. Save the changes and test your form. You now have a form with groups divided in section and will only display based on a certain input. As always, feel free to ask for assistance via the JotForm Support Forum if you encounter difficulties while implementing this solution. Is it possible to give the Section Collapse header a different colour when it's visible (uncollapsed) compared to it's colour when it's invisible (collapsed), to make it stand out? One this page of your site, there is a word that is not spelled correctly. It is In this sentence I am quoting from the word in brackets [for]the word I believe to be meant as [form]. 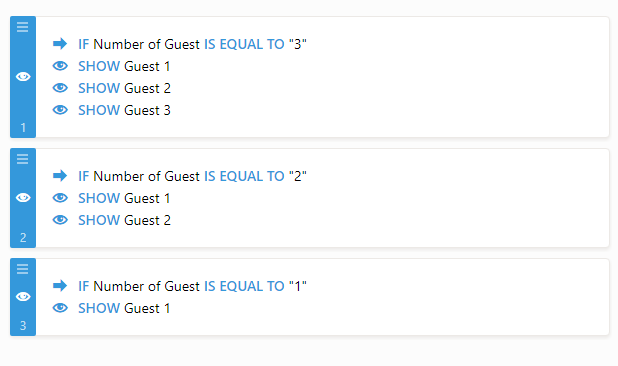 Here's a simple [for] that shows each section for a guest depending on the number of guests entered: https://form.jotform.com/53531501583955. Below are the steps on how the conditions are setup for the section collapse field. Hi. At this stage I'm not interested in the conditional control of a field, but I can't find any other help on the Section Collapse Field to ask this in. How do you define the end of the section that is to collapse? At the the moment the whole page of the form collapses, but what if I only want part of the page to collapse? What is the purpose of being able to make the button invisible, and therefore unselectable? Is that so you set it to be operated exclusively by the conditional logic? I think the collapsible sections are a great tool. They work just fine, but what is a real pain is the JS animation that comes with them. It's sluggish, unnecessary, could be optional and ultimately makes the tool a bit awkward to work with. To be specific, it makes it overall difficult to apply CSS to the element - it is set to work with the fixed height of 60px and would look horrible if I were to override the height with my own rules. Also... if a browser has no support for CSS animations, maybe it'd be better off with no animations whatsoever. I would like to show sections based on checkbox answers. Example: I have checkboxes with clothes (t-shirts, polos, hoodies). If the person choose polos and hoodies, how do I show only these sections. As I will have at least 8 products to show, I'll have 8 sections. It's pretty hard to do all the combination for 8 products (56 possible combinations). I understand this function and this is what I am looking for in my form, however I have maybe up to 50+ sections that I would like to show based on the user input. For example if I choose the number 45 in a field, I would like my form to show 45 sections of the same questions. Therefore, based on this method I would have to set up 50 or so duplicate sections, all with section collapse and separate logic. Quite a long process. Is there no way to duplicate a section on the live form based on a user input? ie so I don't have to input so much data into the form builder on setup. Is there any way to make it so that you can open more than one section at a time? I'm finding that if I open a section, the previously open section automatically collapses. Thanks. I would like to show all fields at once on my form for all users regardless of their response. How can I do this? These tutorials would be a lot more helpful if you'd use the correct terminology. First, this is called a Section Collapse, not a Form Collapse. Second, when you say 'visibility' and 'status' you really mean 'Section Visibility' and 'Button Visibility'. Thus to "end your section" you need to set the Section Visibility to Visible and the Button Visibility to Hidden. i have a form with over 100 fields and there are some fields which refuse to show even though I have set conditional logic to show them. I have gone through every single condition set to see if there is something preventing them from being shown. No luck. Any ideas? I'm using form collapse so that recipients of this survey can only look at the topics of interest to them. Is there a way to NOT have the submit button under a collapsible section? My collapse stopper is still visible despite being open and hidden. How can I get it to disappear? Hi, are there any pre built templates for booking a conference? We are looking to build a form where delegates can book their places on certain venues and choose which workshops to attend whilst inputting their details. It would be a great help if there was something for us to work from. Where do I get the Previous Employment option button from I cant seem to find that option when making my own form? Under "1. Insert a form collapse at the beginning of each section", you have a screen shot with "Page Break" highlighted, not Form Collapse. Is that what you meant? I have a multiple choice answer that serves as the basis for which set of questions to answer. As long as you make a selection, it's working fine. But when you first arrive to the form, one of the sections is still showing. I can't figure out what I'm missing. I tried adding it an additional condition of "if X" "is empty" then to hide all of the fields. So that until a selection is made, you can't see any of the choices. When that didn't work, I tried adding a Form Collapse section and moved all of these fields into this section. I placed a collapse stopper field as well. I give up! how can I edit a conditional logic I created already ? Any way I can customize the form collapse field with a graphic instead of text? Hello, I have two sections in my form and want to apply conditions. If they select a one hour option I want to show one hour section. If they select 20 minute option I want to show 20 minute option. I've only been successful adding one condition. When I apply the second all conditions fail. Thank you!